This seed has been collected from an as of yet unnamed selection in VanDusen's collection. Growth of the parent tree appears to be limited, dense and bushy. The cones develop a deep grey-violet colour and mature to dark brown in the late fall. 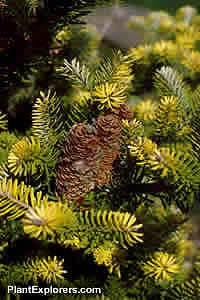 Typical of Abies species, the cones disintegrate to distribute the seed in the early winter. A superb candidate for bonsai. Seed supply is very limited. Grow as for A. koreana. Seed may be started by sowing in containers in a coldframe as soon as the seed arrives in late winter or early spring. Stratifying, or chilling, for at least 21 days will assist with germination. Grow in fertile, moist but well-drained, neutral to slightly acidic soil in full sun, preferably with shelter from strong winds. Does best in areas with cool summers.